By Helen Blanchett, Jisc’s scholarly communications subject specialist, with contributions from Dr Danny Kingsley, Deputy Director Cambridge University Library – Scholarly Communication & Research Services, Anna Grigson, Head of Content and Discovery, LSE and Education officer for UKSG, and Claire Sewell, Research Support Skills Coordinator, Cambridge University Library. Over the last 2 years, representatives of several organisations and institutions with an interest in skills development around scholarly communication have been trying to progress support in this area in a collaborative way (see full list of members below). Blog posts by Danny Kingsley on the Cambridge Unlocking Research blog (July 2017, Nov 2017) describe initial discussions and early activities around identifying issues to address. 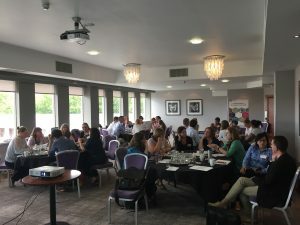 These centred around concerns around a lack of training and support for these relatively new roles and a confusion for potential applicants around what these roles actually involve. This post reviews activities from 2018 and looks ahead to this year. Most of the last year’s activities were related to library staff working in scholarly communications, mainly due to the heavy representation of librarians on our group, but also that this is a major area of development in academic libraries. Our initial aim is to explore support for librarians and then review this to see to what extent it is appropriate for others involved in scholarly communications, such as research managers, researcher developers and, of course, researchers themselves. One of first activities was to identify existing current provision in order to identify clearly the gap in what’s needed. We’ve drawn together this list and will keep updating – please add to it if there’s something you know of that’s missing. We also produced a high-level draft framework, based on existing frameworks such as NASIG and COAR, and have been using conference sessions to get feedback on the framework and how training could be developed in this area. 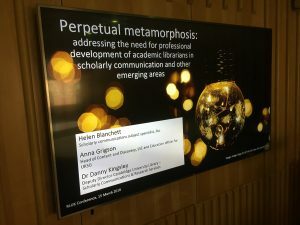 At the Research Libraries UK 2018 conference, Danny Kingsley, Anna Grigson and I delivered a session on “Perpetual metamorphosis: addressing the need for professional development of academic librarians in scholarly communication and other emerging areas”. how to build a flexible and responsive CPD framework. General issues raised included the need to balance skills across a team and the importance of soft skills, such as those required for communication and collaboration and adaptability and resilience to deal with an ever-changing environment. Specific knowledge mentioned included copyright, bibliometrics and awareness of the publication process. These topics are not covered at all or in any depth in library schools. The ability for library staff to have confidence, credibility and authenticity were seen as vital. Focus on the ‘what’ before focussing on the ‘how’ ie define the skills required first before considering the delivery method. Develop ‘pathways’ for different specialisms within scholarly communications, to build on a core baseline of skills. These pathways would include suggestions for required knowledge at different levels. Consider the role of the librarian in scholarly communications – is this more about the type of person rather than the skills and knowledge? If so, where does that leave the library profession? The slides with notes from the discussions are available here. 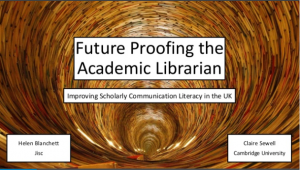 At the LILAC18 conference Claire Sewell and I led a session “Future proofing the academic librarian: improving scholarly communication literacy in the UK”. We asked attendees to share their understanding of what this means to them, to identify their own needs in this area and to suggest how these needs could be met. We used Claire’s research as a starting point for discussion. Participants discussed these questions in groups and then fed back into a larger discussion, the results of which can be seen on the Padlet wall used during the session. The results showed a diverse understanding and often confusion around what this means! A lot of the discussion focused on what this term actually meant to attendees. 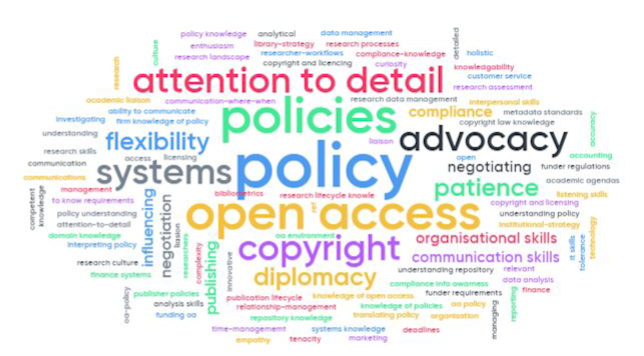 Some expressed their definitions in the form of the activities they associated with roles in this area with many highlighting areas such as open access, data management and copyright. There was also an acknowledgement that these terms were defined in different ways depending on local contexts. Others talked about the need for cultural change in their workplace. 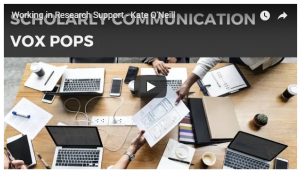 Much of the work around scholarly communication and research support is a departure from traditional methods of doing things and this can sometimes be hard to implement in an organisation. Part of the role of the research support librarian is helping to deliver a change to the culture and attendees were keen that this element was included in any scholarly communication literacy plan no matter what level they worked at. The term scholarly communication also came under fire, with one attendee saying “it’s a stupid term – we need something that makes more sense to people”. 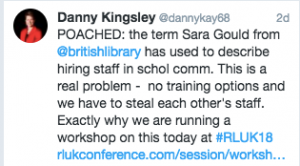 This is something that crops up often when discussing jobs in this area and perhaps adds to the confusion felt by librarians looking to move into this line of work. We then asked attendees to look at the specific skills they would like to develop. Again, the areas that attendees identified as being particularly important reflected the way in which research support was dealt with in their institution. Copyright emerged as a clear front-runner with many attendees highlighting it as the “foundation for the rest of scholarly communication”. Other popular topics included research data management, open access, bibliometrics and the publishing process in general. In addition to core subject skills, attendees discussed the need for the development of personal attributes such as adaptability and problem-solving skills. The issue of advocacy was also raised. Although sometimes termed a soft skill, attendees were quick to point out that there is often a need to advocate for the open research agenda and the necessity of dedicated research support roles. They felt that without solid knowledge of the basics it would be hard for them to communicate this message to either colleagues or researchers at their institution. The group touched on preferred development methods and highlighted the need for basic introductions to the different elements of scholarly communication. Many had come across terms such as open access and text and data mining and understood the basics but lacked the confidence to pursue full time roles in this area. There were calls for introductory materials or perhaps 101 type classes which would serve as a high-level overview of the basic concepts in order to begin the real upskilling process. It was not a surprise that attendees identified several issues. However it is approached, it was acknowledged that no type of skills map or framework would work across all institutions. Everyone is doing something different or interprets these services in different ways so staff need different levels of skill. An additional problem is that if any framework is made too high level then it becomes meaningless as anything more than a superficial introduction. Additional feedback showed that some attendees were unsure about how scholarly communication fit into their existing frontline role when it was not part of their dedicated responsibilities and that this barrier would need to be overcome if any training were to be implemented successfully. The series of 4 events run by Jisc last July were attended by over 120 people. One part of the day was devoted to discussing skills and reviewing resources from the 2014-16 open access good practice projects to help identify useful resources that could be updated or that were needed. What topics should any support resources cover? Our first poll question focussed on the roles within institutions and the responses reflect the policy focus of most of these roles, with understanding and interpreting policy and copyright requirements being central. Communicating those requirements through advocacy was also key. Poll results: What 3 areas of skill / knowledge are most important in your role? Broader discussion highlighted a desire for tools to use to support institutional processes, such as a baselining checklist for annual progress, case studies for research intensives and smaller institutions; guidance on workflows; OA reporting checklist; approaches to advocacy; shared advocacy resources eg research lifecycle, REF eligibility. Poll results: What are your training and development needs right now? When focussing in on the needs of individual staff members, our poll identified research data management as the main current need, followed by licensing and more technical aspects of repository management such as using APIs. Discussion highlighted a need for resources focussing on basic level ‘core’ knowledge such as fundamentals of OA/scholarly communications or ‘an introduction to APCs’, complemented by more in-depth resources in topics such as: technical aspects (APIs, data mining, systems admin), metadata and standards; licensing and the UK-SCL. Resources that could enable existing professionals to keep up-to-date would be valued, as scholarly communications change so quickly it’s easy to become out of date. What kind of resources are needed? How can we make these useful? After reviewing the open access good practice project resources, some key points about making resources usable and useful emerged. The resources should be concise and ‘at a glance’, easily discoverable with good descriptive information to judge appropriateness, perhaps through a central repository / searchable knowledgebase. 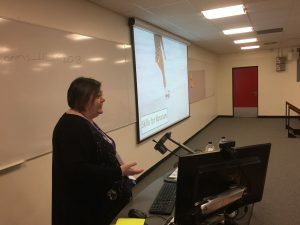 Challenges around creating shared support resources in this area included the timeliness of the resource – the face-paced environment of open access means that institutions need to address problems quickly and resources come along too late. Also, as processes and systems vary from institution to institution, resources may not be very transferable. Along with skills and knowledge, the role of personal attributes for scholarly communication roles provoked an interesting discussion. Some views were that these attributes were actually more important than the skills and knowledge, as the latter could be acquired more easily. Flexibility, good communication skills and creativity were all mentioned, but patience came out top in the poll. While this may be true, some question whether we wanted to recruit candidates using ‘patience’ as the key attribute! This strong emphasis on the importance of personal attributes led to discussion about whether we need to radically rethink job descriptions. The requirement for library qualifications in many of these roles was questioned. However, we need to be careful not to ‘oversell’ the roles as although they are fast-changing, a lot of the role can be mundane and repetitive. A common complaint was that job titles aren’t very helpful in describing roles and perhaps some work could be done in this area to standardise language. 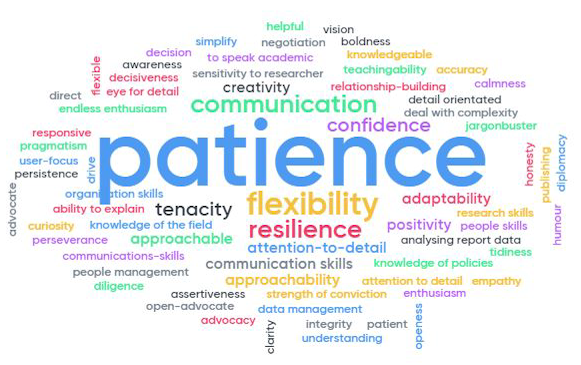 Which personal attributes do you think are most valuable in scholarly communication roles? October 2018 – Vox pops: what’s it really like to work in scholarly communication? In October we attempted to address the issue of baffling job descriptions and lack of understanding about scholarly communication roles. Too often those from a library background, both new and more established professionals, don’t know enough about these roles and the skills needed to be successful in their application (or even to apply at all!). 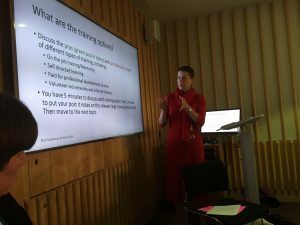 Inspired by the 23 librarians programmes which took place across the UK a few years ago we invited (So what is it really like to work in research support and scholarly communications? ) 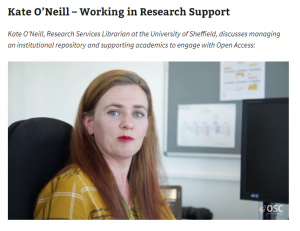 those working in scholarly communication and research support to share their thoughts with us in the form of short vox pop video interviews. The contributions so far are summarised in the blog post In their own words: working in scholarly communication and more will be released shortly. In October, UKSG ran a new course on an “Introduction to open access publication lifecycles and compliance”. Designed as an introductory course, it aimed to give an overview of the key stages in the publication lifecycle of a journal article from submission to publication, with perspectives from institutions, publishers and intermediaries such as infrastructure providers. The course had good attendance and feedback was very positive. Feedback did show that the attendees had a wide range of knowledge meaning that it was difficult to pitch to the right level. It highlighted the practical difficulties of any training in this area – it is such a diverse, fast-changing sector so to find something that has broad enough appeal to make running the courses sustainable, is a challenge. 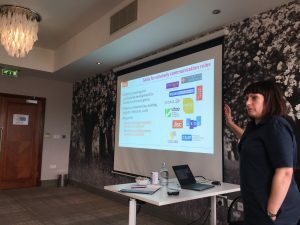 Jisc is hosting a community workshop in York on 7th February to enable sharing of practice in supporting skills development for scholarly communication and open access. At the workshop we’ll look at the draft competency framework and flesh this out with specific skills and knowledge. This will feed into a sector wide resource. Our next challenge will be to review the competency framework and the outputs from the York community workshop. We are pleased to have recently welcomed Dr Andrew Cox from the University of Sheffield Information School to the group and hope to have one of Sheffield’s Masters students supporting our work. We will continue to explore issues around recruitment, particularly focussing on job descriptions and creating a better understanding of these roles and whether standardisation of language is desirable. We’d like to further our efforts to ‘demystify’ these roles for potential applicants, so if you’d like to contribute your own experiences please contribute a vox pop or blog post, see this link. In April, Anna Grigson and I will be presenting and getting feedback on activities at the UKSG conference in a session on “Developing careers in scholarly communications support: opportunities and challenges”. Jisc’s digital capability service was launched in 2018, which includes at its core an assessment and diagnostic tool. There are also a range of institutional support resources available, alongside an active community of practice which meets twice a year. The current service focusses mainly on support for teaching and learning, but we are exploring how and whether this should be extended to research. There is already librarian and researcher profiles available and we will shortly release a research support professional profile. Over the coming months we will plan to set up an expert group to inform our digital capability activities in the research space. When the various organisations got together to discuss this issue, we had planned not to have a name as we wanted our activities and outputs to be channelled through the existing networks and web sites. However, as time has gone on, it’s been difficult to communicate our activities as the ‘group with no name’. After some discussion, we’ve settled on the Scholarly Communication Competencies Coalition (SC3) and there will be a web presence on the UKCoRR web site shortly. However, we still plan to cascade outputs and activities via various professional networks, so this isn’t yet another place to have to keep up-to-date with.